Funeral services for Mrs. Pearlene Smith Harvey of Fort Valley, Georgia will be held on Thursday, October 27, 2016 at 11:00 a.m. at New Hope Baptist Church in Montezuma, Georgia with Reverend Allen Waters and Reverend Willie G. Harvey officiating. Burial will follow at the church cemetery. There will be a wake service on Wednesday, October 26, 2016 from 6 to 9 p.m. at New Hope Baptist Church. Mrs. Pearlene Smith Harvey, daughter of the late Henry Smith and Essie Mae Preston Smith was born August 27, 1944 in Montezuma, Georgia. She was educated at Flint River Farm School and D.F. Douglass High School. She was united in holy matrimony to Reverend Willie G. Harvey on June 26, 1960. From this union of 56 years, five children were born. Mother Harvey accepted Jesus Christ as her personal savior at an early age. 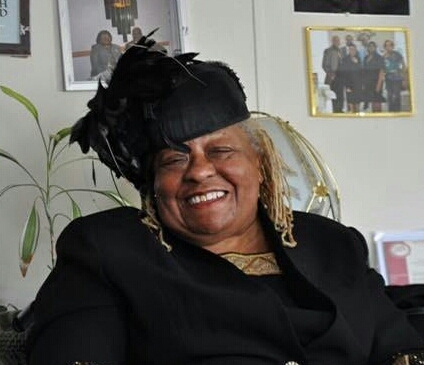 She served faithfully as First Lady of Peace Baptist Church in Rochester, New York. She also attended Bible School, served as Sunday Service Speaker, member of the Usher’s Ministry and Missionary Ministry. Mother Harvey received various awards and certificates for her dedication and many accomplishments during her lifetime. Mother Harvey was very dedicated to her family. She and Reverend Harvey fostered over seventy-five children and became adoptive parents. While in Rochester, New York, she was employed at Eastman Kodak Company. She was known for her many sayings. One of her favorites was, “I’m so tickled!” She will always be known as the lady with the beautiful smile and fancy hats. Sister Harvey received her wings on October 18, 2016. She leaves precious memories to be cherished by her devoted and loving husband of fifty-six years, Reverend Willie G. Harvey of Fort Valley, Georgia; her loving children: Harriet (Robert) Tillard, Edyth (Jansen) Jones, Willie Harvey, Jr., Rickey (Juanita) Harvey, Glen (Bernadette) Harvey of Rochester, New York, Jerry (Nina) Dowdell of Syracuse, New York, Evanna Harvey, Kevin Harvey, Robert Harvey, and Justin (Quanna) Harvey of Rochester, New York; her godson, Michael Foster of Rochester, New York; thirty-nine grandchildren, twenty-nine great grandchildren; her siblings: Lucille (Johnny) Cullen of Miami, FL, her twin sister Merlene Smith of Montezuma, Georgia, Christine Hinton of Montezuma, Georgia and Herman (Daisy) Smith of Byromville, Georgia; sisters-in-law and brothers-in-law: Annette Smith, Janie Mae Smith, Frederick Harvey and Rosie Carter of Montezuma, Georgia, Barbara Jackson of Tampa, Florida and Lucious (Virginia) Harvey of Atlanta, Georgia; one aunt, Maggie (George) Hosley of Syracuse, New York; a host of nieces, nephews, cousins and friends. I am sorry to hear about the death of your dear lived one. The Bible will give you the hope and comfort you need during this time of sorrow. Isaiah 25:8 states,"He will swallow up death forever, and the Sovereign Lord Jehovah will wipe away the tears from all faces. Jehovah himself has spoken it." Also John 5:28,29 promise a future resurrection for those who have fallen asleep. A life without tears, death and pain will soon be a reality. Hold on to hope by faith. On behalf of our Pastor and First Lady Ray Neal (Ester) Fisher and the Pentecostal Memorial Baptist Church Family, we offer our sincere prayers to you. We pray that God's unmerited favor will see you through this grievous time. Please know that in God's hand you can find comfort. Please allow Jehovah God(Psalm 83:18)to help you by means of his consoling word the Bible, he promise in the near future to do away with death and tears(Revelation 21:3,4),(John 5:28,29). You can find real hope and strength by meditating on God's promises, he cares for you and feels for you in your pain(1 Peter 5:7).